"This is a beautiful and flavorful salad with a fresh ginger dressing. The cap of the shiitake mushroom has a meaty flesh with a lot of flavor; reserve the tough stems for stocks. White or cremini mushrooms can be substituted. These are less expensive, but not as flavorful." Cook pasta in a large pot of boiling water. Meanwhile, clean, stem, and slice mushrooms. Add mushrooms and red bell pepper during last 2 minutes of cooking. Drain. In a small bowl, mix together vinegar, soy sauce, oil, and ginger. 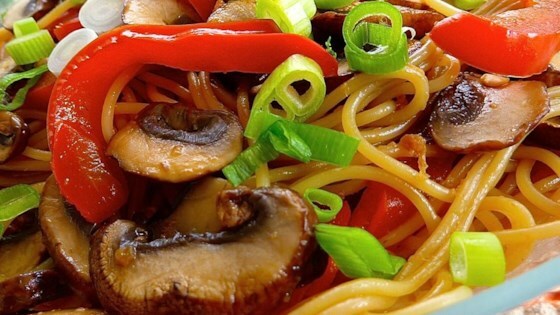 Transfer pasta, mushrooms, and pepper to a serving bowl; toss with ginger dressing. Sprinkle with parsley before serving. Good and very easy. I added sesame oil, sesame seeds, and red chili peppers to recipe. this is good recipe and I will cook again. I did not like the parsey in it. I added carrots and green onions. It is all on person preference. It is one you can play with. Overall, very good!